John Moore/Getty ImagesMembers of a migrant caravan cross the Mexico-Guatemala border on October 21 near Ciudad Hidalgo, Mexico. “We are a great Sovereign Nation. We have Strong Borders and will never accept people coming into our Country illegally!” he tweetedWednesday. One of the most popular conspiracies currently circulating online is that George Soros, the billionaire philanthropist and Democratic donor who is regularly targeted by the right, is funding and organising the migrant caravan. 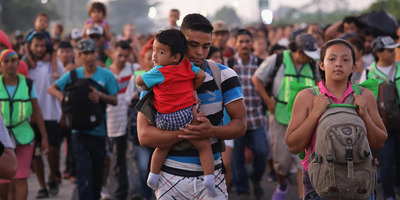 The conspiracy that Soros and other non-governmental organisations are funding the caravan, which began in Honduras, appears to have come from the Honduran ambassador to the United States, Marlon Tábora Muñoz, who sent a video of men purportedly handing cash currency out to migrants in Honduras to Florida Republican Rep. Matt Gaetz, a close Trump ally.